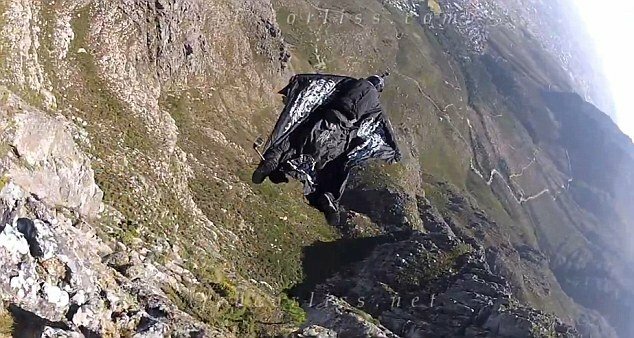 Jeb Corliss, the world famous stunt artist who almost died after crashing into a cliff during a botched leap from Table Mountain in South Africa, today posted incredible footage of the accident on his website. Jeb Corliss, a 35-year-old Californian daredevil, broke both of his legs and was airlifted to hospital following the horrific smash last month in Cape Town. The base jumper was being filmed for a television documentary when he careered into a rock face after leaping from the famous landmark wearing only a winged flying suit. Jeb Corliss, who has spent more than five weeks in hospital since the January 16 accident, today posted a chilling video of the smash on the internet. The incredible video lasts almost three minutes and is entitled Table Mountain Crash All Angles. The video starts with a black screen containing a warning message: “May be disturbing for some viewers”, before showing Jeb Corliss fearlessly starting his stunt. It shows the daredevil leaping from the flat surface of the mountain and soaring towards the sea. Seconds later the accident can be clearly seen as Jeb Corliss’ legs smash into a rock face, sending him spiraling towards the ground. The horrifying moment of impact is repeated several times from multiple angles during the video, which is played out over upbeat rock music. Later scenes show Jeb Corliss deploying his emergency parachute as he realises something has gone wrong. Jeb Corliss, who was wearing a camera mounted on his helmet during the stunt, then appears to bounce along the ground before coming to a halt in a bush. A series of still images then show the moment of his impact in detail. They reveal how the experienced base jumper appeared to misjudge the distance to the rock face, which was marked by a helium balloon tied to a rucksack. Instead of soaring over the cliff, he collides with the rocky outcrop from just below the waist. Following the accident Table Mountain officials said it was a miracle that Jeb Corliss had survived after he fell around 200 feet from the 3,500 foot-high landmark. The stunt man, who has made a name for himself as one of the world’s most daring base jumpers, was airlifted to hospital and needed surgery on both of his legs. Michelle Norris, spokeswoman for the Christiaan Barnaard Hospital in Cape Town, today said he remained there under observation and was due to be discharged on Friday. The spokeswoman said: “Mr. Corliss needed extensive surgery on his legs and also needed skin grafts to repair the damage. He suffered serious and injuries and remains in the hospital, although he has been making good progress in recovery. Jeb Corliss’ video record of the incident concludes by offering thanks to those who helped rescue him following the smash. Jeb Corliss’ botched Table Mountain leap came as he made a documentary for an American television network. The daredevil has previously made headlines with a string of other base jumps. The extreme sport involves leaping from buildings or mountains with only a parachute or winged jumpsuit to aid the jumper’s landing. Jeb Corliss has previously made successful leaps from the Eiffel Tower in Paris and the Christ the Redeemer statue in Rio de Janeiro. how are jeb corliss's conditions ?